My great-grandfather Charles (Kazimieras) Guokas Sr. (1863-1939) owned a house at 1314 Railroad in Houston, Texas, from about 1895 until his death in 1939. He left it in his will to his daughters from his first marriage to Stefania Jasilionis (died 1899). The house is long gone; the railroad is still there, but the actual street (if there ever really was one in this area) is also gone. I decided to work backward in tracing this house. An ad I found in The Houston Post in January 1907 gave 1314 Railroad as Charles Guokas' address, and indicated that a new house at 1717 Shearn was for rent. The Guokas family had moved to the latter address by the time the 1908 Houston city directory was published. The wooden structures with an address of 1314 (and 1314 and 1/2) on Railroad show up on the 1907 Sanborn maps. The yellow coloring indicates that they are made of wood. Note that the house falls between what were then Hickory and Oak streets. Oak was renamed Goliad sometime after 1907 but before 1924. Also, this section of the map looks about the same on the 1924 Sanborn map, at least as far as 1314 Railroad is concerned. Sanborn Map Company. Houston 1907 Vol. 2 Sheet 1, map, 1907; New York. (texashistory.unt.edu/ark:/67531/metapth550296/m1/1/: accessed May 6, 2017), University of North Texas Libraries, The Portal to Texas History, texashistory.unt.edu; crediting The Dolph Briscoe Center for American History. Sanborn Map Company. Houston 1896 Sheet 47, map, 1896; New York. (texashistory.unt.edu/ark:/67531/metapth551114/m1/1/: accessed May 6, 2017), University of North Texas Libraries, The Portal to Texas History, texashistory.unt.edu; crediting The Dolph Briscoe Center for American History. I found my great-grandfather listed in the 1895 Harris County Precinct 1 tax roll (click the image below to enlarge it). This gives the legal description of the property: Baker Addition Lot 2 Block 473, Evans Survey Block O. "Texas, County Tax Rolls, 1837-1910," database with images, FamilySearch (https://familysearch.org/ark:/61903/3:1:939F-WD9M-W?cc=1827575&wc=M636-7N5%3A161548701%2C161401301 : 21 July 2016), Harris county, Precinct no. 1 > 1895 > image 285 of 317; State Archives, Austin. There's another reference to a similar legal description in a July 1, 1897, newspaper notice on real estate transfers from the previous day. "Gus Guokus [sic] to Stafania Guokos [sic], 50x100 feet in Sweatman [sic] tract, part of lots 1, 2 and 3, block 473, Baker additon, N. S. B. B., $1." I believe Gus was supposed to be Chas (a common abbreviation for Charles), and notice that Guokas is spelled two different ways, neither of them correct. The N. S. B. B. stands for North Side Buffalo Bayou, and 50x100 feet was the common dimension of a lot in this area. A map further down in this post will show that lots 1, 2, and 3 make up the lot that 1314 Railroad is on in the 1896 and 1907 Sanborn maps. I'll also explain the part about the (misspelled) Sweetman tract, and the Evans Survey mentioned in the 1895 tax roll. Given that this transaction only cost a dollar, I believe my great-grandfather was simply putting the property in his wife's name. The Galveston Daily News. (Galveston, Tex. ), Vol. 56, No. 99, Ed. 1 Thursday, July 1, 1897 [Page 3], newspaper, July 1, 1897; Galveston, Texas. (texashistory.unt.edu/ark:/67531/metapth442409/m1/3/?q=%22block+473+baker+addition%22: accessed May 6, 2017), University of North Texas Libraries, The Portal to Texas History, texashistory.unt.edu; crediting Abilene Library Consortium. The 1890 Sanborn map, pictured below, doesn't show any development in this area (click on the map to enlarge it), the large rough-rectangle north of the railroad, west of the Old Cemetery, south of Dart street, and east of Houston avenue. I believe my great-grandfather acquired his land in this area in 1895 and built a home there no later than 1896. 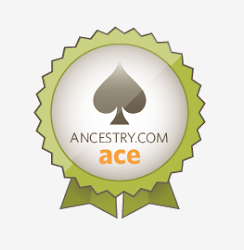 Daughter Mary Margaret ("Mamie") was born in February 1895 in Hearne in Robertson County, but I think the family moved to Houston soon after that. Note in this map, the area is referred to as "Hollingsworth," which was the original name of the survey in this area, done by S. P. Hollingsworth and filed in July 1838. Sanborn Map Company. Houston [October] 1890 Sheet 1, map, 1890; New York. (texashistory.unt.edu/ark:/67531/metapth551431/m1/1/: accessed May 6, 2017), University of North Texas Libraries, The Portal to Texas History, texashistory.unt.edu; crediting The Dolph Briscoe Center for American History. Here is the 1885 Sanborn map for the area. What I like about this map is the block numbers along Dart street - these will be relevant later. Again, there is no development in the large area bounded by Dart on the north, John on the west, the railroad on the south, and Tenth on the east. Sanborn Map Company. Houston [August] 1885 Sheet 1, map, 1885; New York. (texashistory.unt.edu/ark:/67531/metapth550211/m1/1/: accessed May 6, 2017), University of North Texas Libraries, The Portal to Texas History, texashistory.unt.edu; crediting The Dolph Briscoe Center for American History. 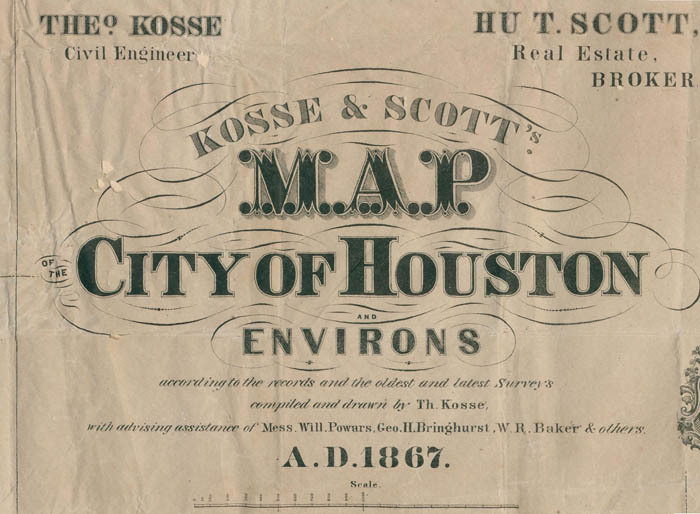 The next map comes from the Kosse and Scott map of Houston dated 1867. Here's the relevant part of the map enlarged a little more (click on the image to make it even bigger). Note the parcel labeled "Swetman," a misspelling of Sweetman. It is part of this piece of property that became 1314 Railroad. This area of Houston has a complicated history in the deed records, according to some research done by Kent McMillan, a land surveyor. He references a map called "Plat Showing the Baker, Shearne [sic] & Riordan Add. [ition]" that is also called Map No. 300-A, in the records of the Houston City Engineering Department and held by the present Houston Department of Public Works and Engineering. He believes this map was originally created prior to 1857, because it does not show the Houston & Texas Central Railway tracks on West Street [later Railroad Street] that were reportedly laid in 1856. The map is not the original; it also has some handwritten notes dating from 1894 and later (for example, Oak becoming Goliad after 1907). Click on the image below to enlarge the map. On both the map above and the closeup below, the additions of block numbers in red and the yellow highlighting of three lots are mine. There appears to be a seam or fold line on the map right where the block numbers would have been; 471 had already been handwritten in to the block to the left of the ones in question. The numbering is consistent with the sequence used in the area just below, and 473 matches up with the legal descriptions for the property in the 1895 tax roll and 1897 real estate transfer notice. The three lots highlighted in yellow are the lots 1, 2, and 3 referred to in that 1897 notice. Apparently sometime between this roughly-1856 map and the 1897 notice, my great-grandfather purchased parts of lots 1 and 3 (he apparently owned lot 2 in 1895) to create a new lot that fronted on Railroad Street. 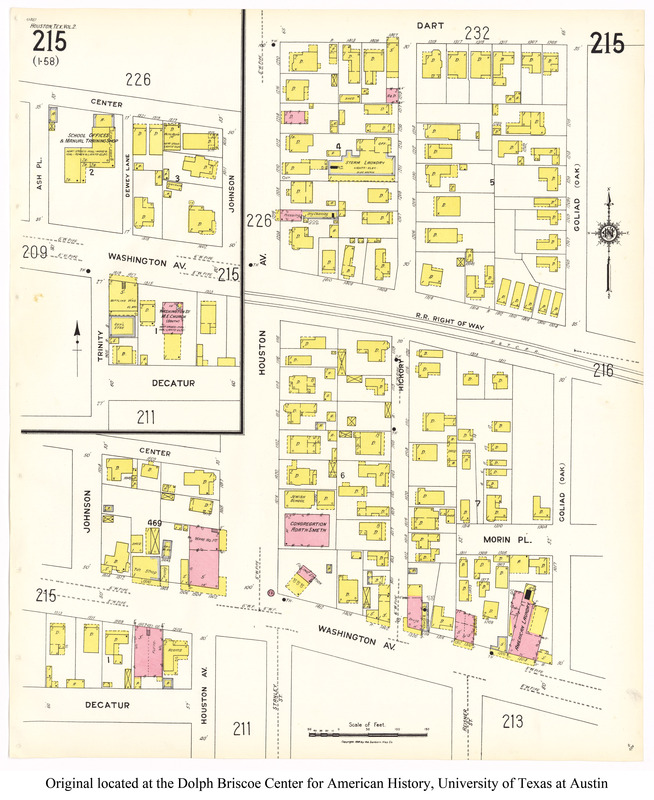 The standard lot size at the time was 50 feet by 100 feet, and that's about what his new lot was sized (according to the scale on the 1907 Sanborn map). It's just that now the 100 feet runs north-south instead of east-west. Note that its perimeter measures 50 feet - 100 feet - 51feet - 110.4 feet, because it's not exactly rectangular due to the railroad. The legal description for this lot is "TR[act] 2 BL[oc]K O EVANS." The City of Houston has owned it since at least 1988; the area is currently used for a police tow-away compound, and the buildings on it are long gone. Take a look, below, at the plat (from the Harris County Clerk records online) for a small development at the southwest corner of the intersection of Dart and Hickory (click on the image to make it larger). Tracts/Lots 5 and 12, just above my great-grandfather's Tract 2 in the map above, are referenced below as "Lot 5 (or 12) Block O Evans (unrecorded"). The development in question is part of Block P Evans. Here is the legal description on the plat for the development pictured above. Note that it references the Hollingsworth Survey in the John Austin Two-League Grant, Abstract No. 1, North Side of Buffalo Bayou, as well as the Evans Addition. Apparently, even though the Evans plat is unrecorded, that seems to be what most of the legal references now use, as opposed to the (also unrecorded) Baker addition. That might be because Baker's 1856-ish plat subdivided some lands he did not own! So somewhere this land picked up the designation as the "Evans Addition," with blocks "numbered" with alphabet letters. I'd love to find that map, as well as one with the block numbers for the Hollingsworth Survey. Note that while the description above mentions that survey and some lot numbers, no block number is given. Nevertheless, I'm confident that I've identified the "right" piece of property that was in the Guokas family from at least 1895 through at least 1939.